Tis the season for durians.. If you are in Penang and love durians, you are at a sweet spot! Everyone knows Balik Pulau is famous for its durians but going there to the orchards could be quite an effort. The great news is the durians are now coming to you in the form of a durian promotion which will be held at the New World Park on Burmah Road from noon to 8pm daily from today until the July 31. Durian varieties available include the famed Mao Shan Wang (King of Civet Cats) as well as Ang Sim (red heart), Khun Poh, Ang Heh (Red Prawn) and D24. Mangosteens and rambutans will also be sold alongside the durians. Tip from a durian farmer: “Good durians can be smelt from a distance instead of having to sniff up close, and are lighter compared to durians yet to fully ripen. Know more about durians, that heavenly fruit. Oh what fantastic names Mao Shan Wang (King of Civet Cats) as well as Ang Sim (red heart), Khun Poh, Ang Heh (Red Prawn) and D24. How about HappySurfer going at RM30 per kg I mean the fruit named after you..everybody happy hehe. 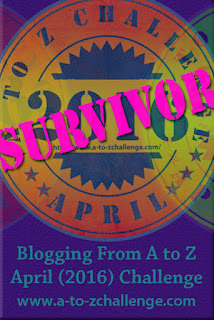 Those days D24 is like the top of the range but not now. Can remember eating them at McCalister road with my CEO and our British counterpart who is a kwailo who loves them and Penang ice coffee, wearing ties eating by the road side haha ~;). 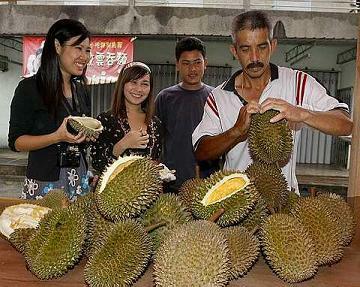 I love durians!!! And my favourite is still D24!!! No need buy the more expensive Musang King! Haha!! Oh? Your expat colleague eating durians? Cool! I remember mine running around his house looking for the source of 'that smell'. His housemate returned home earlier with a fruit and stashed it somewhere just as a joke. Some joke! SK, you don't know what you're missing! Oops! I only love the actual fruit not durian-flavored stuff such as candies, cakes, etc. Foong, you're welcome. D24 too is still my preference. I like its texture and its sweetness. Enjoy the fruits this season! Is it or Is it Not Anwar Ibrahim? Friday Frolics - What Hobby Are You? Friday Frolics -What Color Pumpkin Are You? Shopping bags that tickle, a lot..